© Copyright Cameraman and licensed for reuse under this Creative Commons Licence. The firing of the Fenny Poppers was the first ceremonial custom I intentionally visited. True, I had come across such events before, the Lord Mayor’s show, Morris dancers (some of my earliest memories which speaks volumes perhaps) and the odd bit of Maypole dancing. But this was different. I had read about it in an old book on customs and was intrigued to find out more. In those days, there was no internet and the first port of call would be the local Tourist misinformation Centre as I call them. I rang up Milton Keynes and unsurprising, as I wasn’t after accommodation or information on theme parks, they were unable to help me! That’s not strictly true they did suggest I contact the church. So with my copy of Crockfords, I rang up….but didn’t get through. I decided to go anyway….if it wasn’t one there were always other things to do around it. I turned up in the village, now a suburb of that large Milton Keynes and asked. “It happens at the rec”. At first I was confused by this, until the lady directed me to the recreation ground. Here were the poppers, miniature canons, embedded in the leafy soil of that park. Pocket canons which pack a punch! 364 days a year, these six strange objects, which resemble small beer tankards, hang in that parish church. Then on the 11th they are brushed down, filled with gunpowder and fired! Called ceremonial cannons, it is thought that the originals dated from 1740, but may have indeed been medieval as their instigator collected such items. They unsurprisingly became cracked and deteriorated such that they were re-cast in 1859. It is still remarkable that they are still being used. These guns were placed upwards and slightly buried, loaded with charges of around an ounce of black gunpowder. Then with twelve foot metal rod with a red-hot end, made so in the church furnace, they were lit gleefully by the church warden and they certainly made a bang. This ceremony happens at noon, 2pm and then 4pm. Originally, the ceremony was at the church by the collateral damage to both it and the Bull it was moved to more open ground. When I visited, the custom was bereft of any cones and cordoning, only the bellowing of the church warden to look out! It is noted that by tradition the vicar fired the first, and local notable people would do the others, but I cannot remember others doing it. This is a strange celebration associated with Dr. Browne Willis a rather eccentric historian who paid for the building of St. Martin’s church in 1730. This being intentional named after his grandfather a noted neurologist, Thomas who lived on St. Martin’s Lane, London, prayed at St Martin in the Fields in London and even died on 11th November! 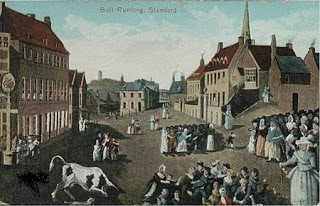 Upon his death, he wanted to make sure Martinmass was truely celebrated and so a sermon was established in his honour of his grandfather, a noted neurologist Thomas Willis, an evening meal at The Bull where turkey would always be served and more excitedly, the firing of the fenny poppers as they became known, on that date. Interestingly its celebration is a rare survival for mention November 11th to many people and Remembrance Day will be their answer and indeed many may confuse the firing with that commemoration but they of course would be wrong. The Firing of the Fenny Poppers is a quintessential British custom, noisy, smelly, enigmatic and to be honest slightly pointless, and all the better for it.